The Montauk Friends of Erin and the Kiwanis of East Hampton had such a great time last year at their first seafood festival that they’re doing it again next weekend. The Second Annual Montauk Seafood Festival will start at noon on Saturday, Sept. 13 and go until 5 p.m. The same hours will apply Sunday, Sept. 14. There will be bands, seafood, a snapper derby for the kids, local beer and wine. The Long Island wine community is mourning the passing of a regional pioneer and one of the industry’s true icons. Dr. Herodotus “Dan” Damianos, founder of Pindar and Duck Walk Vineyards, passed away on Monday at the age of 83 after a long illness. We at Edible East End, would love to thank everyone who came to our annual Food Truck Derby last Friday. There were sliders, pizza from a wood fired oven, delicious ice cream, crepes, grilled cheese and wine and beer and iced tea and so much more. We hope to see you next year and that the weather will be as fantastic as it was this year. For our High Summer Issue, Laura Luciano tells the story of her family’s regular full-moon outings to go crabbing on Quantuck Bay. 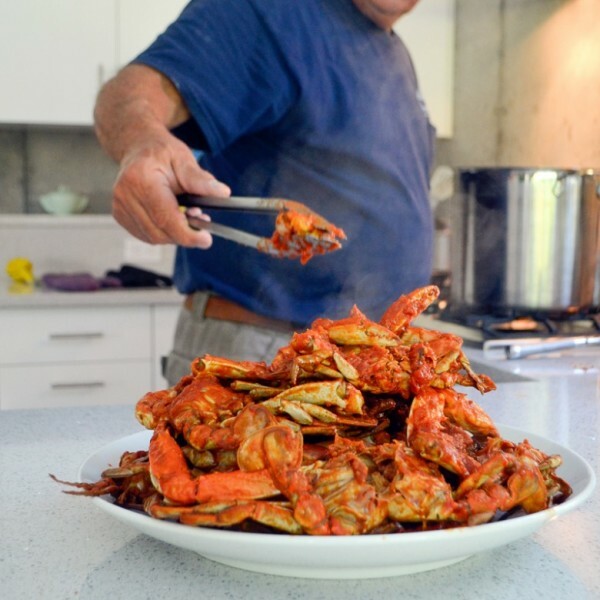 The haul turns into a classic crab feast Italian style. Here’s her father’s famous recipe. In our High Summer Issue, writer Kelly Ann Smith visited with chef Mathias Brodie of the Living Room Restaurant at ℅ Maidstone in East Hampton. In addition to serving up extravagant tacos, Brodie also loves kebabs. He let us in on some of his secrets. “It’s quite simple,” he says. The Long Island Aquarium in Riverhead is sponsoring a wine cruise and lobster bake featuring Raphael Vineyards. The boat leaves from the the dock behind the aquarium at 6 p.m. for a tour of the Peconic River. Upon return, a lobster bake will be served with a cash bar and music. Festivities end at 9 p.m. Cruise and lobster bake cost $69.95 + tax; lobster bake only is $59.95 + tax for guests 21 and older. Cancellations make less than 72 hours before will receive aquarium credit only. Register by calling 631.208.9200, ext. H2O, or in person at Long Island Aquarium. Are You Interested in Becoming a Slow Food Leader? A list of what’s in season in August and September on the East End. It’s certainly feeling like midsummer these days—a little sticky, a little muggy, a little slower and, some nights, too hot to cook. When that’s the eminent feeling (similar, we think, to the feeling that okays Birkenstocks as evening-wear in the summer), Edible’s editors like to leave the cooking to someone else. Here’s where we’re eating right now. If you’re lucky enough to be a member of Long Island first community supported fishery, Dock to Dish, then you’d be getting the e-mails that founder Sean Barrett sends each week. They’re information packed and always include a recipe. This week he featured the in-season, it-fish, striped bass. If you missed our outrageously delicious subscriber-appreciation party, do not fear. You still have a whole summer to enjoy the South Fork Taco Trail, and to sign up for future subscriber parties. Yes, we said Taco Trail.